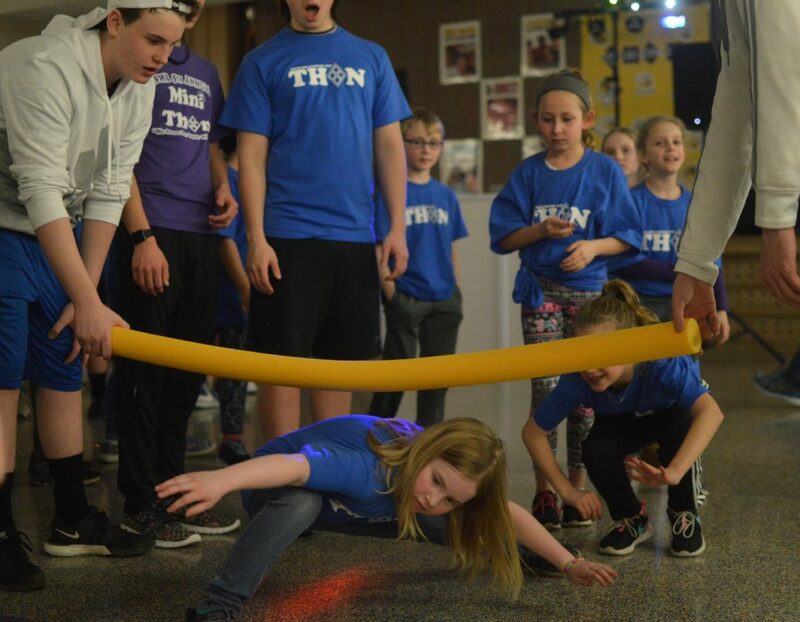 KATELYN HIBBARD/Sun-Gazette The South Williamsport Area High School Mini-THON Club recently brought the fundraising phenom to Central Elementary with Tiny THON. The two-hour event had elementary students running, jumping, dancing, doing the limbo and more in the name of the Four Diamonds Fund, a non-profit organization based out of Hershey Medical Center that helps cancer patients and their families, particularly children. Participants were asked to donate a minimum of $15 and encouraged to raise even more. At the end of the night, the students had raised a total of $2,645.63. Central Elementary School students played and danced on Feb. 17 at their 2-hour Tiny THON to raise money to help children with cancer. Two South Williamsport Area High School 12th grade students, McGwire Molino and Katie Jones organized the event as a civic service project for their social studies teacher Ryan Carper. They said 130 students attended and raised $2,645 for Four Diamonds at the Penn State Children’s Hospital. “They raised more than we expected,” Jones said. Kids played limbo, dodgeball, danced to music and played the mannequin game, where they froze when the music stopped and danced when it began again. There was a DJ who played tunes all evening. Each child had to raise a minimum of $15 to participate. Tiny THON was the prelude to the high school’s 12-hour Mini THON from 7 p.m. to 7 a.m. March 3 in the high school gym. Students must raise a minimum of $60 to participate. There will be dancing, volleyball matches, a bounce house and food. The public is welcome to join in the festivities until 11:30 p.m.
Jones and Molino said they feel passionate about helping kids who have cancer and hope their efforts will bring scientists closer to a cure.